Hotel fire safety had dramatically improved over the years. Fire safety regulation and enforcement has played a very large part in this. Particular regard to fire safety in hotels and guest houses is required because of the inherent sleeping life risk and the building unfamiliarity which most residents have. Hotel fires are fortunately few and far between these days although they do occur. Enforcement actions under the RRO 2005 are surprisingly common. Heavy fines and poor publicity from enforcement action does not help the business. 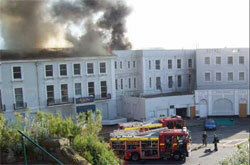 A suitable and sufficient fire risk assessment is required for all sizes of hotel. Staff must be suitably trained. If it goes wrong, the consequences can be severe. Hotel fire safety has come a long way since the Rose and Crown Hotel fire which killed 11 people on Boxing day1969. This fire along with others led to the introduction of the Fire Precautions Act 1971 and the designation of hotels and boarding houses under the same act requiring fire certificates from 1972 onwards. All hotels, guest houses, bed and breakfasts, restaurants etc are now regulated for fire safety under the RRO 2005. 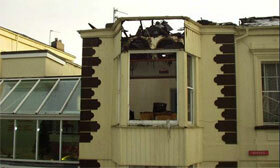 This hotel fire was caused by arson and although nobody was hurt caused serious damage to the property. Unfortunately this hotel never reopened after a serious fire in the roof which was caused by an electrical fault. Many businesses do not survive a fire. Fortunately no one was hurt and all the occupants escaped unharmed.